This is seriously one of the BEST and EASIEST desserts you will ever taste! 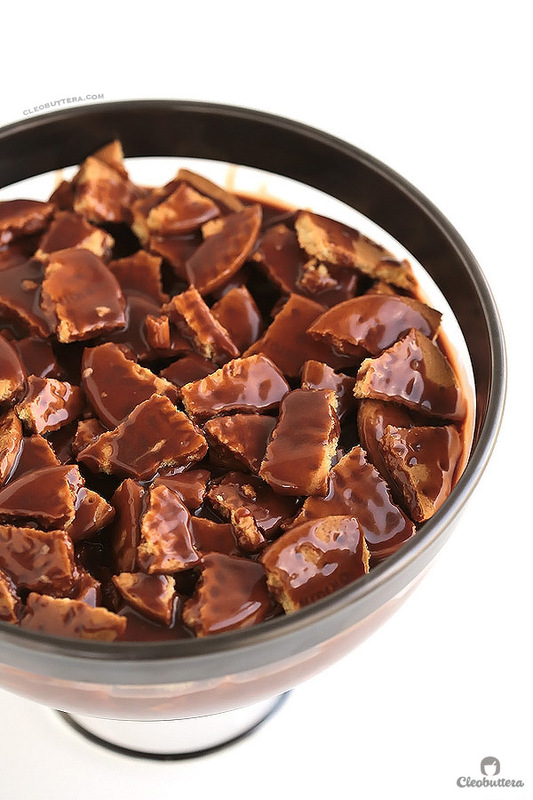 3 ingredients are all you need to make this NO-BAKE, crunchy yumminess swimming in a heavenly Mars bar sauce. Plus…recipe VIDEO included! What? Don’t tell me that wasn’t convincing? Here are the list of ingredients. Grab a pen and paper. You’re gonna need to write this down. 1) MARS BARS. MILKY WAY if you’re in the U.S. Wait! Scratch that. 20 MARS BARS. Yes! TWENTY! And don’t worry if you don’t like Mars; you’re still gonna LOVE this. Promise. I’m gonna go ahead and insert the cliche phrase here…”what’s not to like?” because really? What’s not to like? 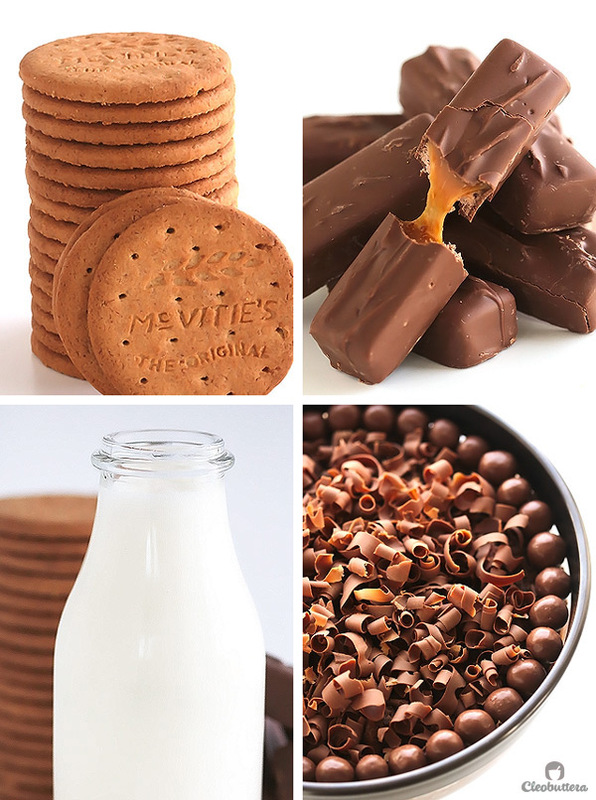 Seriously though…how could anything possibly go wrong by mixing heavenly chocolate sauce made from Mars bars and cream, with broken up digestive biscuits? Oh c’mon aside from that? Good things…only good things my friends. Chocolatey, caramely, sticky things that enrobes crunchy bites of cookieness. Can we make that word? Ofcourse we can. You’d think that a chocolate sauce made from Mars would taste cloyingly sweet, but it really isn’t. 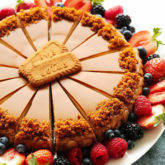 The cream tempers the sweeteness, and when combined with the Digestive Biscuits, which are very lightly sweetened, it just balances everything out. And you know what? 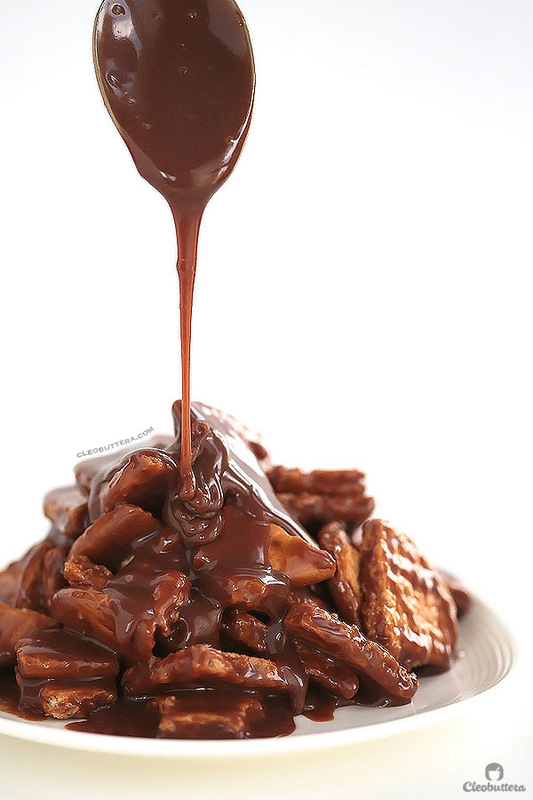 I’m not even a Mars bar fan, but they just happen to make the best chocolate sauce ever! Way better than the bar itself. This is the dessert that all the non-baker, kitchen-haters in my family make. Because it’s that easy, that good and never fails to impress. Which also means that its present in almost every family gathering we go to, and in Egypt, that’s A LOT! But we have yet to grow bored of it. So I’m tellin’ ya…this is a dessert you’re gonna need in your life! 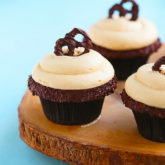 It’s a three ingredient recipe that tastes like a 15 ingredient one. It’s no-bake! Hello oven-free, fuss-free summer recipes. It’s take 10 to 15 minutes to prepare. I mean it’s called “lazy” cake for a reason. You could let the kids do all (or most) of the work for you. It tastes equally delicious warm, at room temperature or cold; I can’t really decide how I like it best. All good! 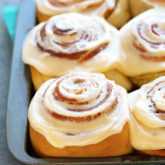 Which makes it a great candidate from a make-ahead dessert. I doesn’t hurt that leftovers taste awesome too. That is, if there’s any. You could dress it up in a trifle bowl and shower it with chocolate curls and pretend it’s a fancy dessert. And boy does it taste a 100X better than any dessert you could buy from a fancy bakery. It will make you a SUPER HERO! For realz. My cousin, Aya, the person responsible for opening our eyes to such insanity and getting us all hooked, has been officially given heroic status in the family because of this. Not really, by kinda. 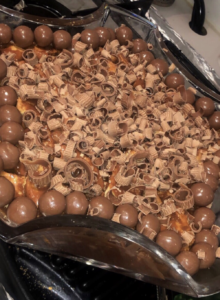 We were gathering several years ago at my Grandma’s, when Aya brought along this ‘Mars Cake’ as she calls it, for dessert. I don’t know how to put this in a nice way, but we looked like a bunch of vultures preying on the bowl of melty, crunchy goodness. Oh my gosh! Mind. Blown. It was one of the best things anyone of us had ever tasted. I’ve tried similar “lazy cakes” before which employs the same idea of mixing tea biscuits with chocolate sauce, but this one was something else; really in a league of its own. Uh-mazing! The Mars chocolate bar really puts it over the top! So anyway. After licking the bowl clean, we gave Aya a huge round of applause fit for a SUPER HERO. And pens and paper to write us the recipe. And that, my friends, is the story of how the ‘Mars Cake’ spread in the family. The end. Let me show how eeeeeaaaasy. 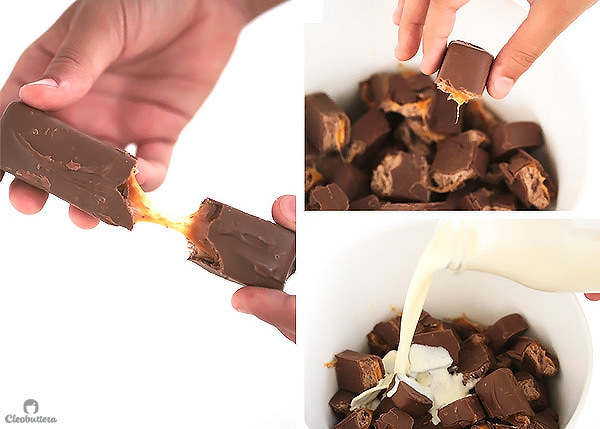 All you gotta do is break up a ton of Mars bars in a bowl, dump in some heavy cream, microwave them. Sauce done. You’re just gonna need to stir the mixture every minute while heating to evenly melt all the lumps. Until is becomes smooth and luxurious like this. Drinkable! I just wanna pour it over everything. 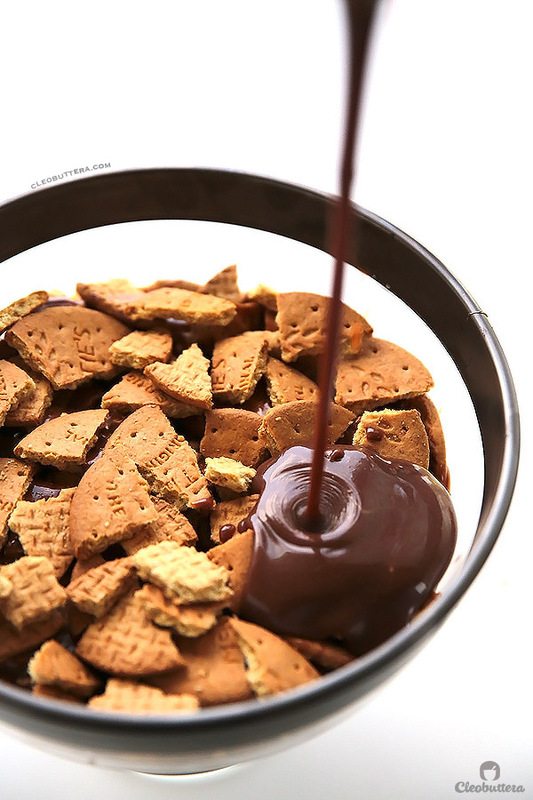 Then you’re gonna break up some Digestive Biscuits in your serving bowl, and pour on some of that ridiculous sauce. You know, just enough to thinly coat and cover the biscuits. Then goes on another layer of broken biscuits. And so on and so forth. Ending with the Mars sauce. Will you look at that people! 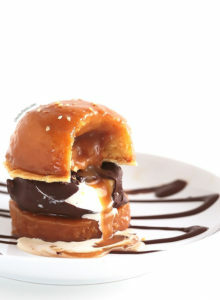 Now tell me this doesn’t look like a fancy dessert, worthy of a fancy occasion. Go ahead…brag about it and let everyone think you slaved all day making it. No one needs to know. Not as pretty when scooped out though, but wait till you taste it…H.E.A.V.E.N.L.Y. I have a feeling this will show up at every gathering you go to too. 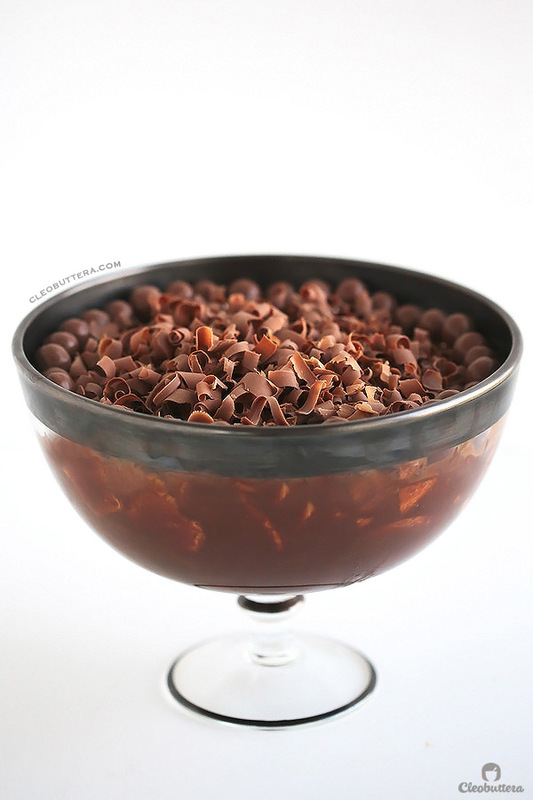 This is seriously one of the BEST and EASIEST desserts you will ever taste! 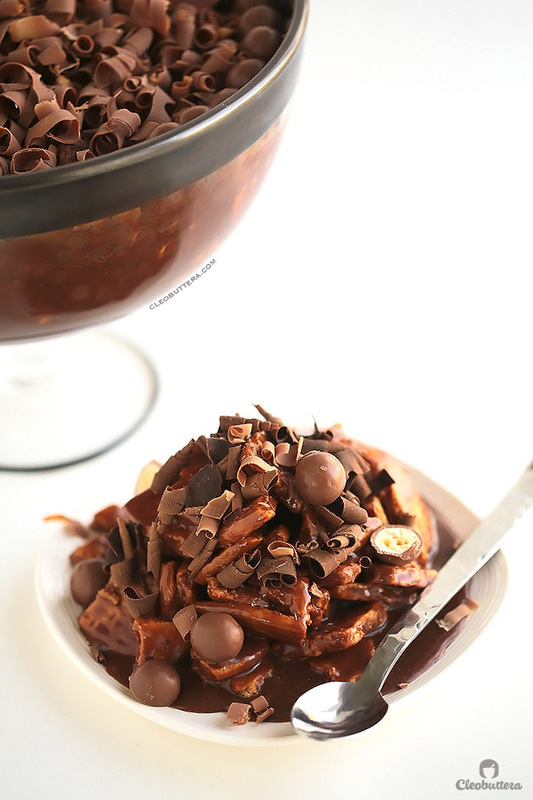 3 ingredients are all you need to make this NO-BAKE, crunchy concoction swimming in a heavenly Mars bar sauce. 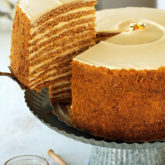 Recipe can be halved or quartered or even doubled for large parties. 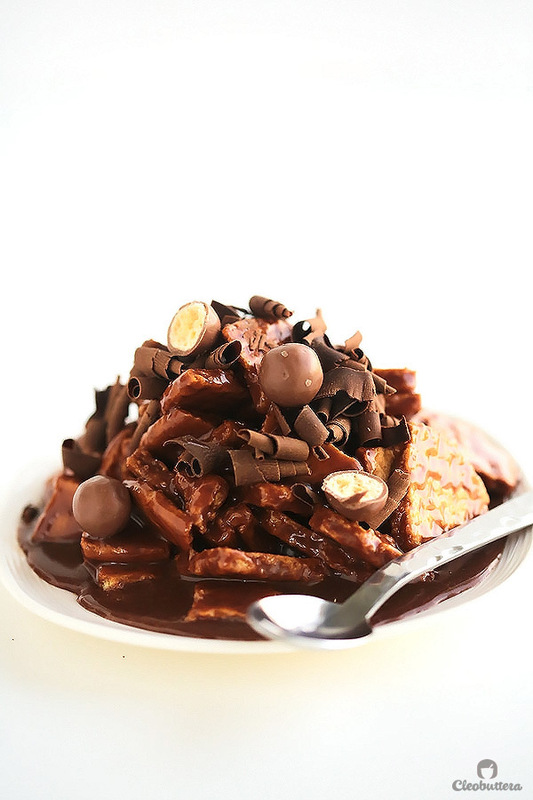 In a large, microwave-safe bowl, cut the Mars bars into large chunks. 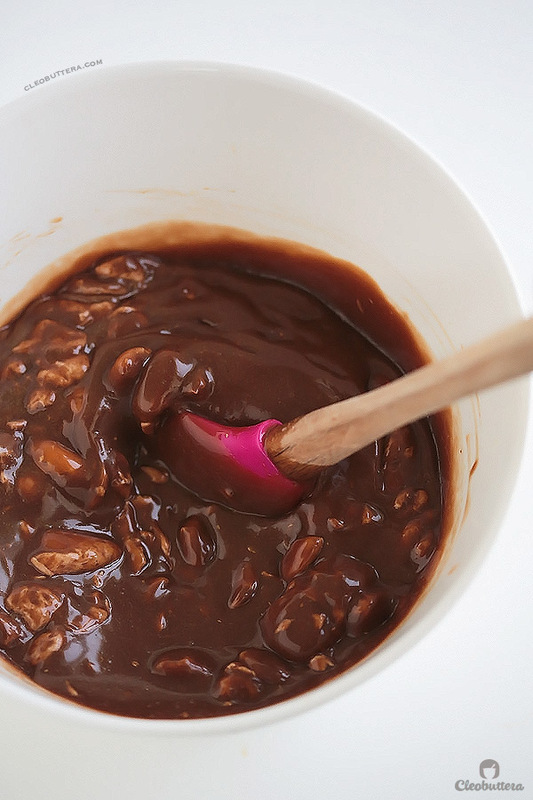 Pour the cream over the chocolate chunks. Heat together in the microwave, stirring every minute, until the Mars is almost melted; about 3 minutes. 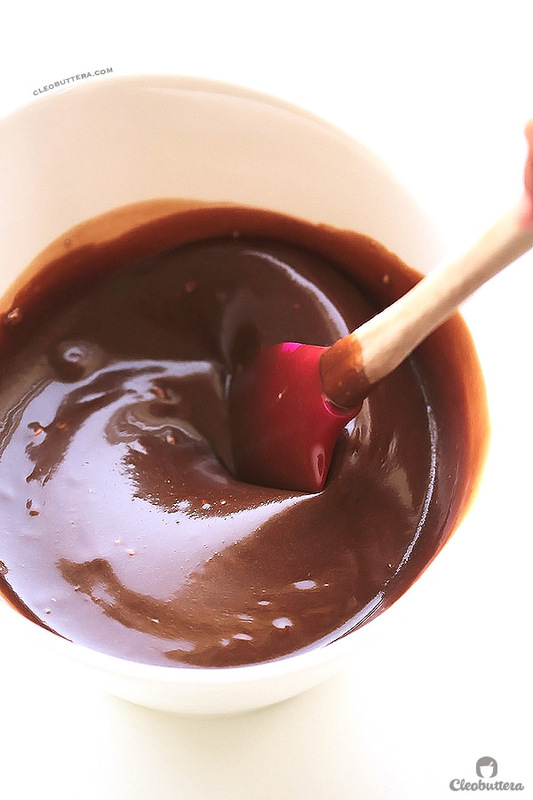 Remove the Mars mixture from the microwave and continue stirring, allowing the residual heat to melt the remaining chocolate. Keep stirring until mostly smooth. 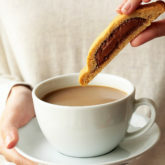 In a deep serving platter, like a trifle bowl, roughly break some digestive biscuits and arrange into a single layer to cover the bottom of the bowl. Ladle on some Mars sauce over the Digestive Biscuits' layer, enough to thinly coat and cover them. 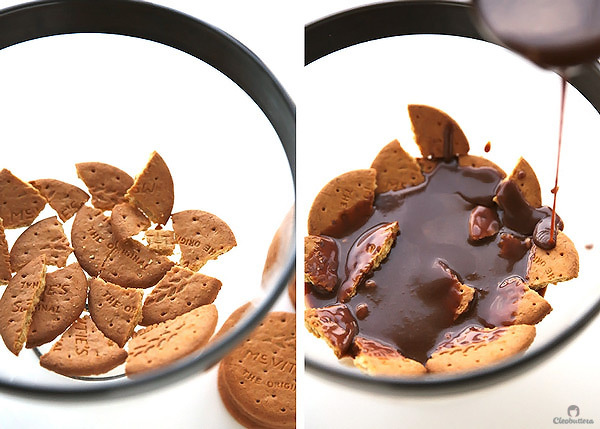 Repeat the process of layering Digestive Biscuits and covering with Mars sauce, ending with the Mars sauce as the final layer. 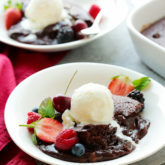 Allow the dessert to cool down slightly for at least 30 minutes in the fridge before garnishing. This ensures that the heat of the sauce won't melt the decorations and also allows the flavors to meld together. 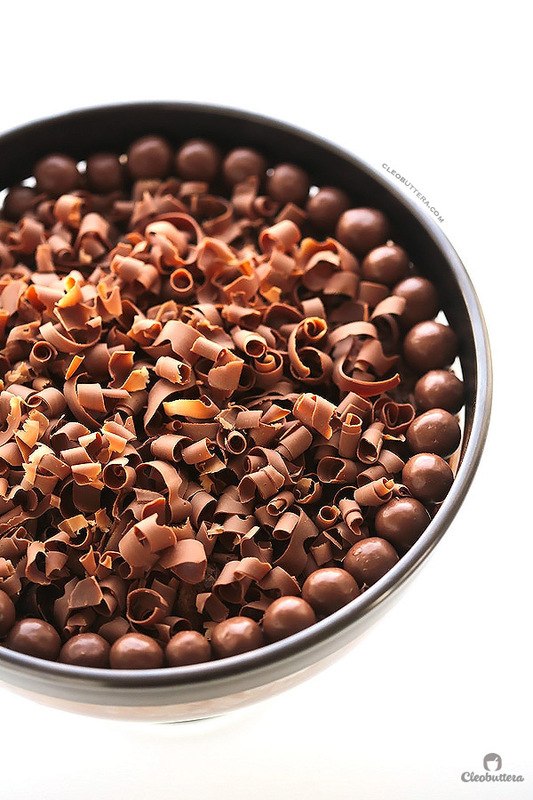 When cool enough, arrange Maltesters/Whoppers balls all around the rim of bowl, creating a ring. 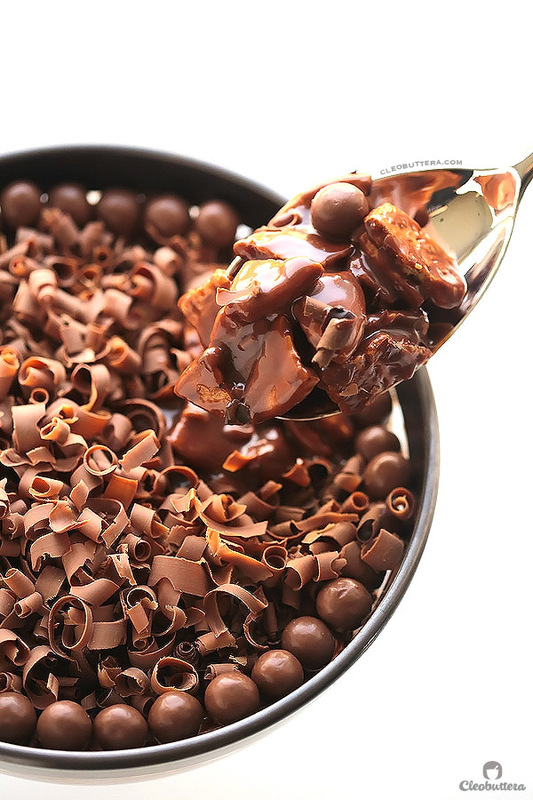 Microwave the chocolate bar for 10 seconds to soften it up slightly for grating. 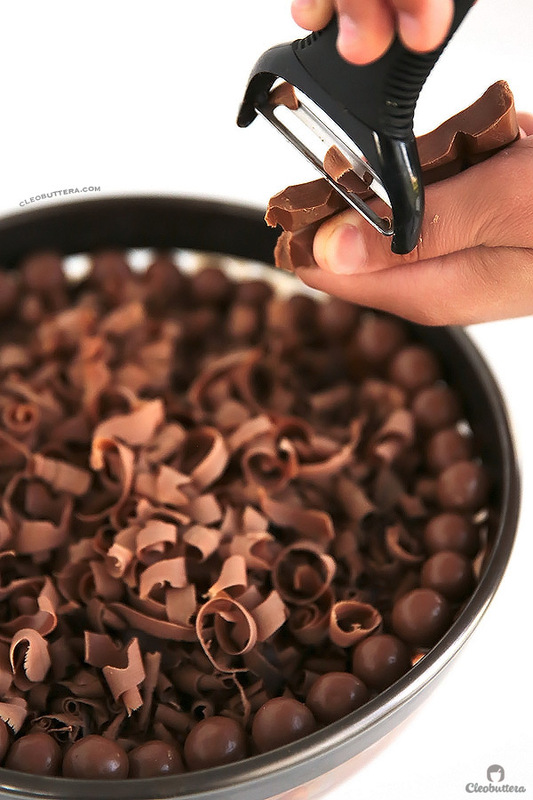 Using a vegetable peeler and holding it right on top of the dessert bowl, grate the sides of the chocolate bar to make curls. Let them fall into the center, inside the Maltesers/Whoppers ring, to cover up all the shaggy biscuit pieces. 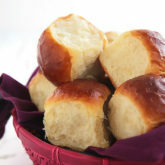 Serve warm, at room temperature or cold straight from the fridge. It's the least fussy recipe ever, and it's delicious in every way or form. I really can't decide which way I like it more; they're all good. Store leftovers, if there's any, in an airtight container in the fridge. 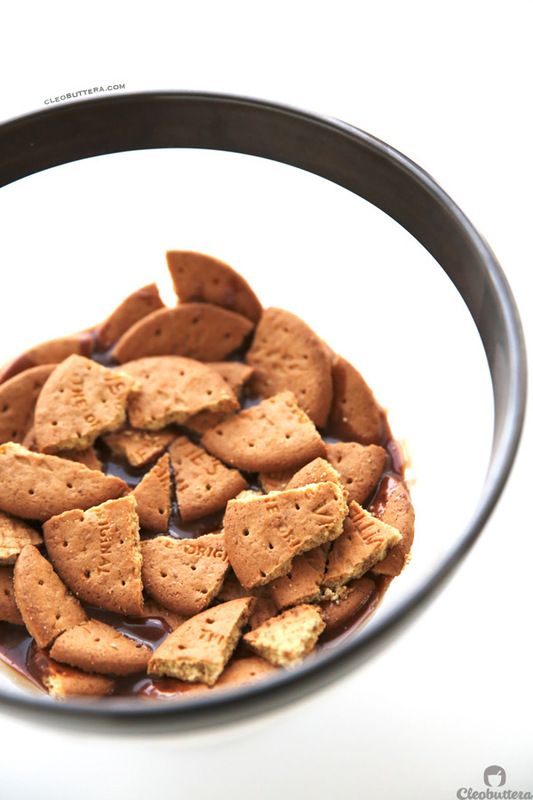 Any tea or butter biscuits (cookies) of your choice can be substituted for the Digestive Biscuits. The amount is according to preference. 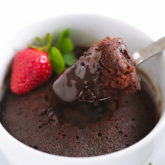 Hold back some for saucier results, and add more for a sturdier, crunchier dessert. Recipe given to me by my cousin Aya, who got it from her friend. Can I make it in cups?? I could drink that Mars sauce, it looks so good! Definitely throwing this together soon 🙂 Pinned. Yumm! Perfect for summer. 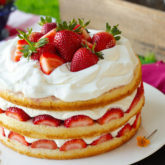 I’m making this with a layer of whipped cream ( I have to add whipped cream to everything for some reason). HOLY WOW. This looks SO, SO good! I want to drink that stuff right from the bowl! I can’t even begin to tell you how good this sauce is. I’m already thinking of other ways to use it in. That’s gorgeous, I love your photography, I probably said that a few times before. But it’s perfect, the white balance, the sharpness, the colors, everything is perfect, well done! As for the cake, Mars is one of my favorite bars, enough said! Oana you always lift my spirits with your kind compliments. As a newbie in food photography that means the world! This looks absolutely delicious. The photos are enticing. You’re amazing. I don’t know how you come up with these things!!! 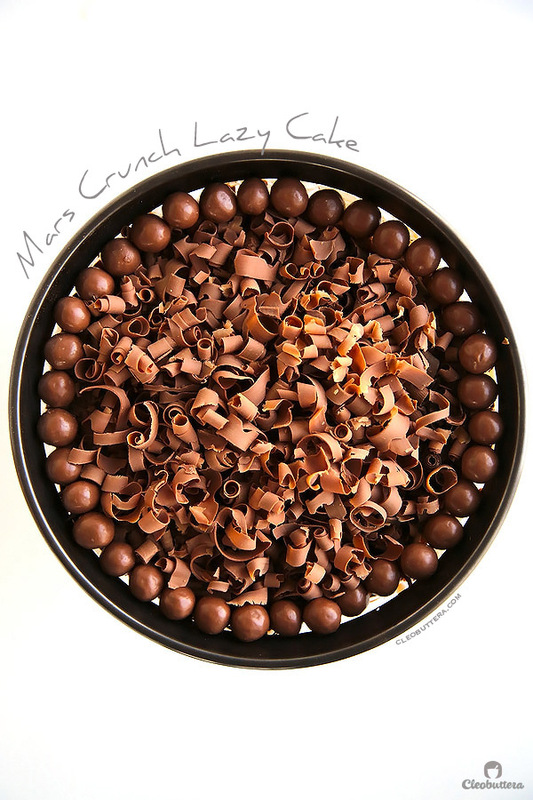 And all those shreds of chocolate… This cake does not look lazy at all! Thank you so much Anne! That’s the trick; it doesn’t look lazy but it is as lazy as it gets. Gosh you are gonna break my fast. Can I also do this with Twix? Hey Sarah:) I wouldn’t really recommend using Twix because it won’t melt properly because of the biscuit layer in it. Try to stick to Mars & I promise you won’t regret it, even if you don’t like Mars. I’m not really big on Mars but the sauce it makes is incredible! Hi awesome recipe! I was just wondering how many grams exactly did you use of Mars bars? I’m glad you like it:) Each Mars bar is 51 grams. 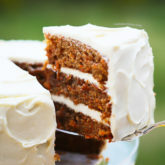 Can i make it a day before eating it, as im having a birthday and will be busy! Yes sure you could make it a day ahead! I’ve actually had to make it several times the night before and it had always tasted just as good. My advise for you is to try and get the sauce as cool as possible before pouring it on top of the biscuits, to slow down the biscuits from soaking up the sauce. This will help the biscuits stay crunchier longer. 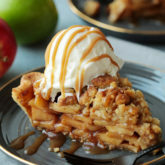 Another thing is to refrigerate the finished dessert overnight and take it out of the fridge about 2 hours before you plan to serve it so it comes to room temperature. Hi Ibrar! It’s my pleasure. Personally I like to allow the Mars sauce to cool down a bit so it’s just warm before adding it. That way the biscuits stay crunchy longer. But it’s really up to you. It’s the most unfussy recipe ever! If you want the biscuits to soften a bit then add it will still hot. Can I use lady fingers instead of the digestive biscuits? I wouldn’t recommend it Mai, as lady fingers are too thick and they are best enjoyed after they get soft, which the Mars sauce won’t do. 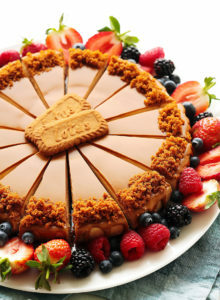 I think dessert is best made with thin crunchy cookies like digestive, tea biscuits, graham crackers & their likes. Do u recommend not to pour the nars mixture until the time of serving? 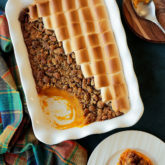 What is better to serve it from the fride immediately or to take it out of the fridge couple of hours prior to serving time? Hi Walaa! You can make it a day ahead if it’s more convenient for you and it will still turn out great! It will soften slightly but won’t become mushy. We’ve had it as day old leftovers & it was still so yummy. However, I prefer to make it several hours (say 3-4 hours) before serving to maintain as much of the crunch as possible. 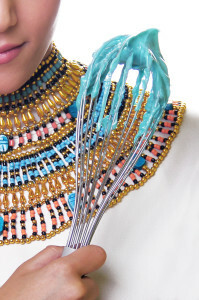 I wouldn’t recommend mixing it right before serving, because you want the flavors to have enough time to meld together. It’s best to take it out out the fridge to get the chill out of it before serving. I personally prefer it at room temperature. Enjoy! Is it bettet to make it in a one whole trifle or like several tony ones ? How many layersof buscuits you think would be enough? Trifle style is so much easier & turns out so elegant. I made it once in little cups and it took forever to make. I’m not so sure how many layers of biscuits it yields as it depends of the size of the bowl I use. I just use up the quantity stated in the recipe. Hello there! this thing looks really amazing and easy! and lovely! gosh I’m a big chocolate fan! I just want to know that if I chill it after making, will it be crunchy for a long time? Its ok you can ask all you want 🙂 Its really good in every way, shape or form. Hope you love it as much as we do! Hi I have a question,when you say heavy cream do I use the juhayna whipping cream or cooking cream or fresh cream?I am really excited to do it.and can I cut the ingredients into half? 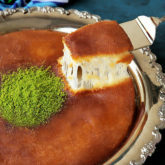 Have been looking around and reading a lot of your recipes before going to sleep, having sweet dreams . 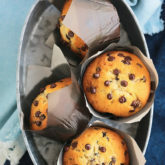 Will try some soon mostly the unbelievable muffin going to take them to work and this one for the weekly gathering along with your soft spiral rolls . I am a male dentist who got this passion for baking since i was a child!! 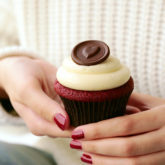 P.s i get crazy as well when people mix between cupcakes and muffins!! 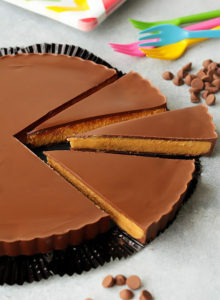 Will be making it today , actually a few hours from now !! Btw just this morning was enjoying that melt in your mouth galaxy muffin with my co-workers , but yesterday that unbelievable muffin was somthing else , was perfectly buttery and had a unique texture !! My friend was enjoying his piece when he exclaimed : “man!! How much butter you threw in there to make so buttery ?! !” Told him not much at all , almost 14 grams per piece but it is a unique recipe !! Oh I’m thrilled to hear that it was such a hit with your guests Fatema! Thank you so much for sharing your feedback and that gorgeous picture. Looks wonderful!